Ray Dalio may be slowing down, but the investment strategy he popularized is just getting started. Bloomberg News reported recently that Dalio, founder of the world’s largest hedge fund, Bridgewater Associates LP, will spread the firm’s ownership among more employees and give them a say about management and governance. Investors may not yet be familiar with risk parity, but that’s about to change. 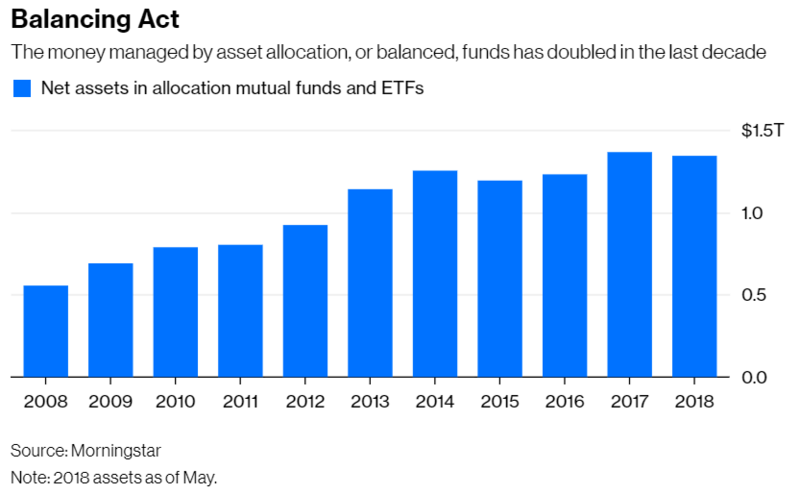 Putnam Investments introduced a risk parity mutual fund last year. Robo-adviser Wealthfront Inc. launched one this year and added it in February to accounts with more than $100,000 in taxable assets, raking in $780 million for the fund so far, according to Morningstar. More funds are likely to follow. Fans of risk parity say it solves a problem plaguing traditional diversified portfolios. Namely, they’re diversified in name only. Consider the iconic 60/40 portfolio of U.S. stocks and bonds. It may seem well balanced, but stocks dominate. Here’s why. The volatility of the S&P 500 Index — a common proxy for risk that’s expressed as standard deviation — was 14.7 percent from 1976 through June, while that of the Bloomberg Barclays U.S. Aggregate Bond Index was just 5.3 percent, the longest overlapping period for both indexes. Because stocks are three times more volatile than bonds, they contribute far more than 60 percent of the volatility in a 60/40 portfolio. As the stock market goes, in other words, so goes the portfolio. For investors who find this concerning, risk parity offers a simple two-step solution. Step one: Reduce the allocation to stocks so that bonds contribute an equal amount of volatility. That translates into roughly a 25 percent allocation to the S&P 500 and 75 percent to the bond index. Step two: Add leverage to reach the desired volatility. For example, the standard deviation of the 60/40 portfolio was 9.5 percent since 1976, while that of a 25/75 portfolio was 6 percent. Lever up the 25/75 portfolio by roughly 60 percent and — presto — you have, in theory, the same expected risk and return as a 60/40 portfolio, but with equal risk contribution from stocks and bonds. Risk parity is achieved. There are endless variations on this theme. More asset classes can be injected into the portfolio, such as foreign stocks, commodities or real estate. The volatility of those asset classes can be estimated using backward- or forward-looking models. And more leverage can be added for higher expected risk and return. Whatever the variation, practitioners say the benefit is the same: More protection during downturns. So far, the strategy has delivered. The performance history of the Salient Risk Parity Index is among the longest, stretching back to 1990. The index targets a volatility of 10 percent, which was comparable to that of a 70/30 portfolio of U.S. stocks and bonds during the period. Despite similar volatility, however, the risk parity index held up far better during the two intervening bear markets. It was down just 1.9 percent from April 2000 to September 2002, whereas the 70/30 portfolio was down 27.1 percent. The index was also down 23 percent from November 2007 to February 2009, compared with a decline of 37.6 percent for the 70/30 portfolio. Still, it would be misguided to declare risk parity a better mousetrap, and not just because more data is needed for such a coronation. 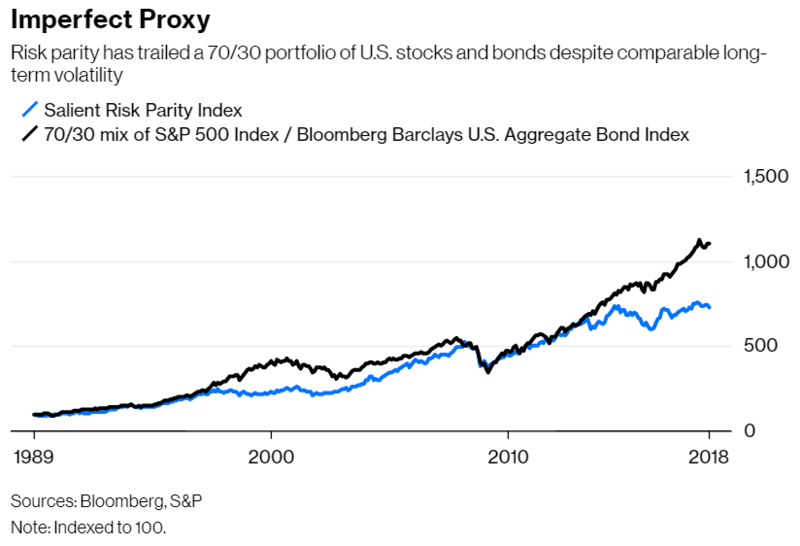 For one thing, the 70/30 portfolio has outpaced the risk parity index by 1.6 percentage points annually from 1990 through June, so volatility hasn’t been a perfect predictor of performance. Also, despite Dalio’s ambitious moniker, no portfolio is all weather. Every strategy will eventually encounter a perilous environment, and it’s not hard to imagine what that environment would be for risk parity. Remember that risk parity is a levered bet on bonds. That bet is likely to pay when interest rates decline, as they have for the last three decades. 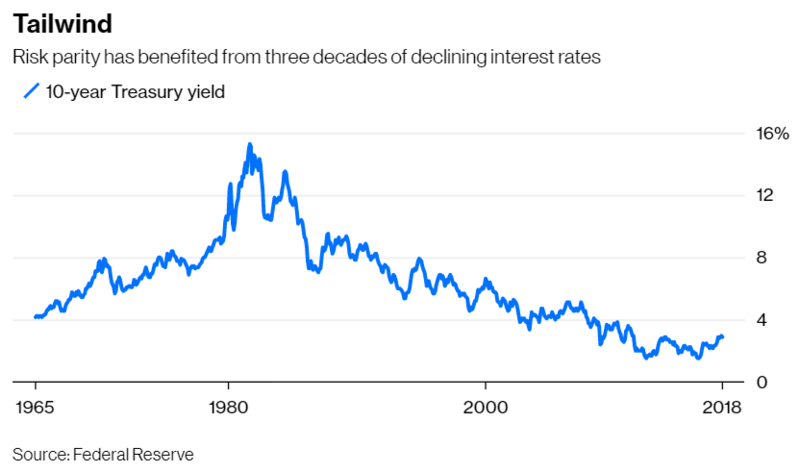 But it’s also likely to struggle when interest rates rise, as they did for nearly two decades when 10-year Treasury yields rose above 15 percent in 1981 from 4 percent in 1965. That’s something to think about with interest rates starting to creep up in the U.S.
Of course, investors are no longer limited to U.S. stocks and bonds. The proliferation of asset classes in recent years — such as emerging-market bonds and foreign real-estate investment trusts and countless others — has opened the door to new ways of constructing portfolios, each suited to different environments. In the not distant future, investors will choose among allocation schemes the way they now choose asset classes. But first they’ll have to do some homework, and risk parity is a fine place to start.